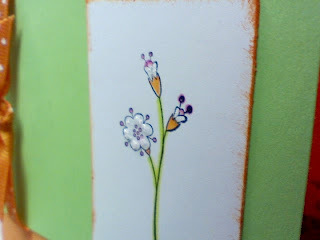 Create Embellish Adore: Finally... A CARD!!! Yes, I know I can hardly believe it myself... but with some of the creative juices left from a great Stamp Camp I attended on Saturday morning, I finished up the cards that I needed for a swap. Though these pictures do not show true colors, you will get the idea. 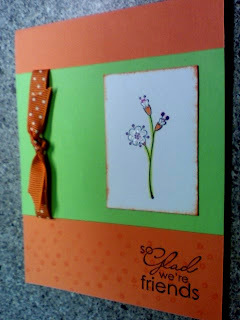 I used Tangerine Tango and Glorious green Cardstock. I have been eyeing these colors up on the fashion magazines for a while, and finally just put them to use. I added alittle pink, which orginally was going to be a layer behind the Whisper White, but I never managed to cut it down, and noticed it while I was cleaning up... "oh look.. the pink!"... oh well. Since I am such a ribbon hoarder, I used this Orange polka dot printed ribbon. I borrowed the stamp set Sweet Stems from a stamping buddy, in which I have given serious thought to purchasing myself... with the possibilities that is has! Just my luck, I will get it and it will retire. Oh well! I just dapped alittle Frosted Ice Stickles on the white part of the flower, after I markered the others with pink, orange, and green. 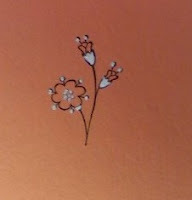 For the inside I managed to repeated the same flower, and just simply use my white gel pen, on the flower, which is on the lower right hand corner.